A recent survey shows that 70% of people look for “Social Proof’ before doing business with a company. For millennials, that number jumps to 84%. So what exactly is ‘Social Proof’? It is simply the process of checking on the internet and social media for proof that your product, advertising and marketing claims are true. In other words, people trust what others say about you much more than what you say about yourself. 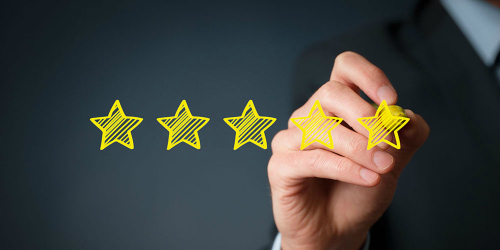 One of the most accessible and familiar forms of ‘Social Proof’ are the reviews and star rating of your business on Google. The maximum number of stars is five. Any rating below four out of five is a killer. How many stars does your business get on Google? Have you ever looked? Have you read the reviews? How many stars do your competitors get? Have you done anything to correct the negative things that folks may have said about you? Your target customers are paying attention to this stuff – perhaps you should too. While doing some online research on the lawn care and snow removal industry recently, I came across a company named ‘Five Star Landscaping and Snow Removal’ in Waterford, Michigan. A great name but on Social Media they get only one star out of five in 36 damming reviews. You can’t screw people around anymore. They’ll get you – and they’re more believable than you are. To complicate matters, there’s another ‘Five Star Landscaping and Snow Removal’ company just 30 miles away in New Haven, Michigan that’s owned by a different person. This ‘Five Star’ gets 4.9 stars and brilliant reviews. How two companies in the same line of work, just 30 miles apart, end up with the same name is a mystery to me – it makes no sense. So, what specific things will you do or fix to deserve and get at least a 4.5 star rating and many glowing reviews from your customers on the internet and social media? And when will you start? North America’s most valuable companies: Of the top ten companies listed on the New York Stock Exchange and ranked by market value, only two of them were on the list ten years ago – Exxon Mobile (the oil and gas giant) and Bank of America. Walmart was number one on the list ten years ago. Now, it’s not in the top ten at all. Apple is now number one by market value – and, it wasn’t even on the list ten years ago. The current top five are all technology companies and none of them were on the list ten years ago. Just another example of how everything in life and business is changing.